Inside: The fact that the delicate but beautiful monarch butterflies migrate is a marvel of nature. 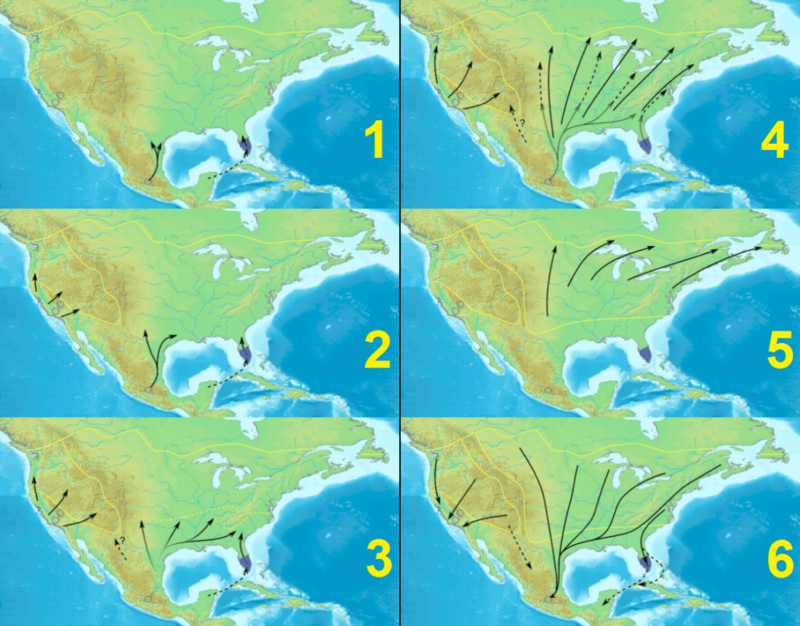 From North America to Mexico, their migration is a marvel considering their small and delicate nature. 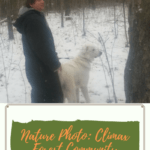 Their populations are declining but there are ways you can help. *There are affiliate links within this post. If you click, I may make some coffee money at no cost to you. Monarch butterflies migrate each fall. I’ve seen signs of their migration with my own eyes. Living on a farm in the Oak Ridges Moraine area of south central Ontario we have lots of milkweed. But, over the past 17 years living here, it has only been the last two summers that I have seen large numbers of monarchs. Last year was the first year I saw monarch caterpillars. Last year monarchs were not difficult to find flitting around the hay fields. This summer of 2018, their numbers seemed to have exploded in comparison. 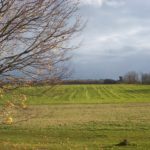 I walk our dogs daily along the tree line of our fields. As we walk, we disturb the resting beauties and they dazzle us with their grace and color. The hay fields are full of lovely purple flowered alfalfa. By far these seem to be the favorite feeding choice of the butterflies on our property. 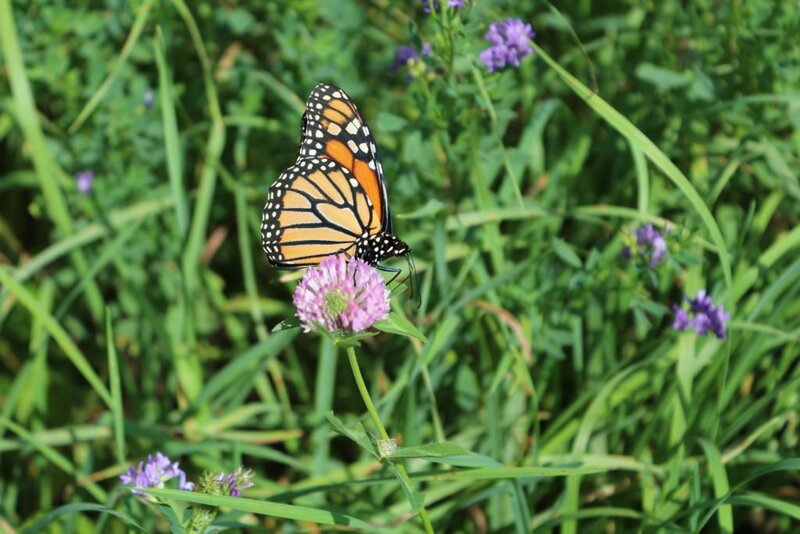 Monarchs feeding on Alfalfa flowers in August on our Farm. 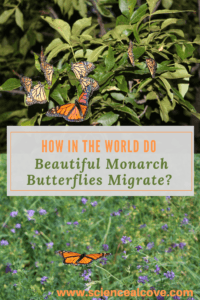 Do all monarch butterflies migrate? The answer is no. They don’t. The subspecies, Danaus plexippus plexippus, that has its summer breeding grounds in northeastern US and Canada, is the only migrating monarch. And unfortunately, its populations are experiencing severe declines. It is an endangered butterfly species. Monarchs, as you can see in the photographs below of specimens I’ve photographed from my property, are mostly orange with black veins. There are white spots along the wing edges. If you look closely at the pictures below, males and females are quite easy to distinguish. Males have a black dot on a vein of each hind wing. Females are missing those black dots. Like all insects, monarch butterflies have 6 legs. Adult monarchs hold their front two legs close up to their bodies most of the time so it looks like they only have 4. They use these two front legs more to taste-test milkweed before laying eggs on it and not for grasping and resting! Yes, monarchs taste using the bottom of their feet. They smell with their antennas and use their compound eyes to find flowers to feed on. 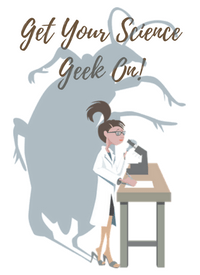 All insects go through some type of metamorphosis. 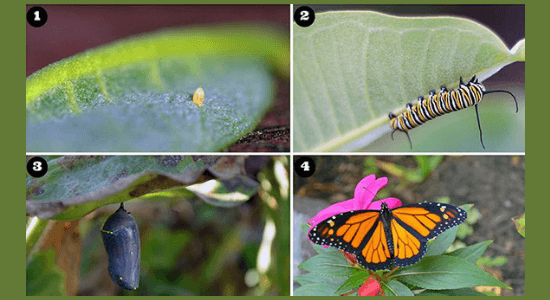 Butterflies go through complete metamorphosis – egg, larva, pupa and adult. Females lay eggs on the underside of the Milkweed plant only. The eggs hatch in about 4 days. The larva or caterpillars, eat lots of milkweed leaves growing quickly. As they grow, they eventually shed their skin, doing this several times before their transformation into butterflies. A monarch caterpillar will gain 2700 times its original weight before forming a chrysalis. One large caterpillar can eat an entire Milkweed leaf in less than 4 minutes. In about 9 to 14 days, depending upon the temperature, these caterpillars form pupa or their chrysalis. Inside the chrysalis, the caterpillar breaks down into a soupy form and gets reorganized into a butterfly. This process takes about 10 to 15 days. In one summer, a couple of generations of monarchs are born. The first generations have a short lifespan of weeks only. 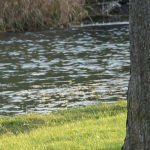 The last generation born in late summer is a super generation that will live for up to 8 months to survive its long migration south. 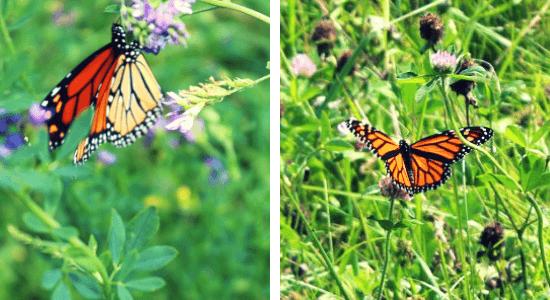 Many animals avoid the Monarch butterfly. Its orange and black colors tell potential predators that they are toxic. And indeed they are. The Milkweed plant has a foul-tasting toxin. That toxin accumulates in the body of the caterpillars and the butterfly making them a bad tasting snack. There are a few predators that will bravely eat these butterflies. Orioles and grosbeaks will feast on these butterflies. Some ant, spider and fly species will prey on the caterpillars. The main role of Monarchs as with butterflies in general, is as pollinators. Adult butterflies visit countless wildflowers each year in search of the energy rich nectar they use for flying and mating. In feeding on flower nectar, pollen becomes stuck to their bodies and that pollen will often be transferred to the next flower they land on. They are important pollinating insects for farmers fields and wildflowers. Monarch butterflies are important pollinators. 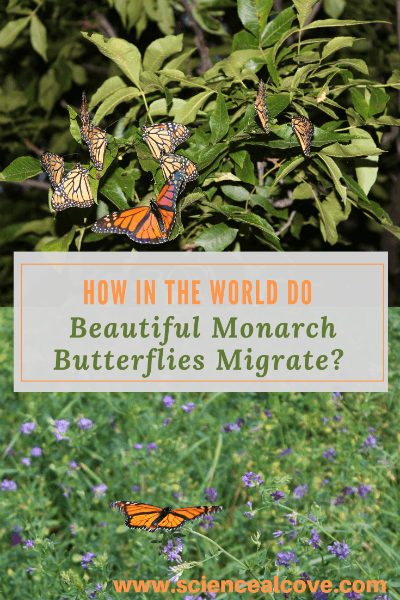 Why and How Do Monarch Butterflies Migrate? 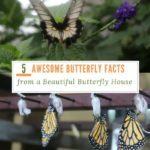 Unlike other butterfly species that can survive in their larval form or as a chrysalid or as an adult taking refuge in leaf litter or trees, monarch butterflies cannot survive in any form the North American winter. So, they migrate to warmer conditions in the extreme south. How they migrate is still somewhat of a mystery. However, a study published in 2016, suggests monarchs navigate based on their position relative to the sun. Birds can migrate. 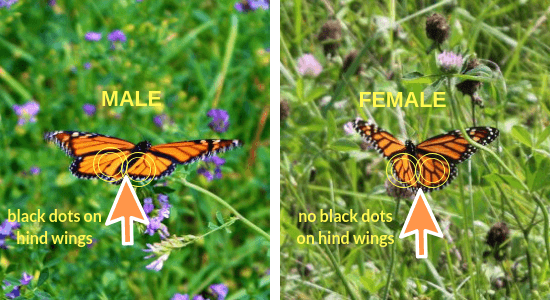 It is possible these butterflies use similar strategies. 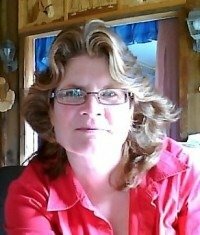 If you want a more detailed, neurological explanation you can read this article by Eva Botkin-Kowacki published in 2016. These butterflies travel about 3000 miles to reach their overwinter grounds in central Mexico. Millions huddle together on the branches of oxyamel fir trees. These trees create a perfect microclimate that protects the monarchs. The tree canopy and ecosystem creates a blanket effect for these butterflies preventing the temperature from going too high or too low. The individual butterflies that leave my farm in Ontario will never return. Unfortunately, it is a one-way trip for these butterflies. After waiting out the winter in Mexico, my butterflies will head part of the way back north. They’ll stop in warmer areas like Texas that also have milkweed plants. There they will mate, lay eggs and then die having lived about 8 months. The new generation that hatches into brilliantly striped caterpillars of gold, black and white will go through their life cycle becoming adult butterflies. These offspring will fly another few hundred miles north, find another patch of milkweed and repeat the process. It might take the monarchs up to 4 or 5 generations to complete the journey back to Canada. Each of these ‘waves’ of monarchs complete their life cycle in 5 to 7 weeks. When fall arrives in Canada and northern United States, a special “super generation” of monarchs is born. These monarchs make use of warm air currents to help them fly the extraordinary distance to Mexico. It is a seemingly impossible feat for such a beautiful and delicate creature. How Can We Help the Monarch Butterfly Survive? Why not get involved improving the chances of survival for these beautiful butterflies. Creating monarch friendly habitat in your garden is a beautiful project to work on with children. It can be done in a school setting or at home. Find resources including free milkweed seed through Monarch Watch and the Monarch Joint Venture.